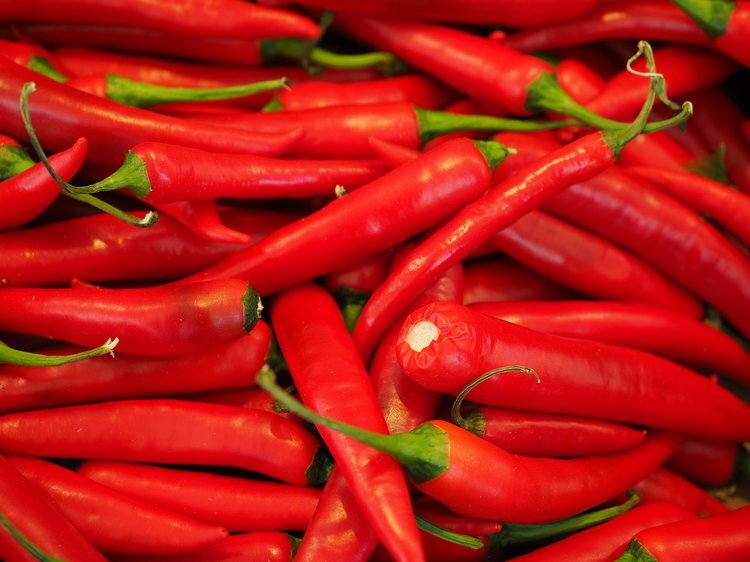 What Are The Health Benefits Of Chili Peppers? Chili peppers are the plants known to add a fiery sensation to your tongue and maybe even a droplet of sweat or tears. Chili peppers are the plants known to add a fiery sensation to your tongue and maybe even a droplet of sweat or tears. But chili peppers happen to be associated with much more than just a pungent taste, as their therapeutic use has spanned for centuries. Prospective medicinal benefits of chili peppers have resulted in their perpetual use to cure diverse ailments. Extensive research has identified their potential to aid with pain reduction, cancer, and type II diabetes prevention, as well as cardiovascular health. Frequent chili pepper intake has been shown to assist in reducing the risk of hyperinsulinemia, having too much insulin in blood, which is a condition connected to type II diabetes. In 2006, the University of Tasmania in Australia published a study suggesting that the amount of insulin that is needed to lower blood sugar post meal consumption is lessened if chili peppers are included in the meal. When chili peppers are consistently incorporated into meals over time, insulin requirements are reduced even further. Research on red chili peppers has exhibited reduced blood cholesterol and triglyceride levels. Adding chili peppers to meals has been shown to demonstrate protective effects on the lipids, or fats, in blood from damage by free radicals, a principal step in the development of atherosclerosis. A Tasmanian study at the University of Tasmania in 2006 suggested that eating fresh chopped chili pepper is associated with an increase in the resistance of blood lipids, like cholesterol and triglycerides, to oxidize and cause free radical damage. Both men and women were involved in the study. However, women experienced a greater lag time before damage to cholesterol was observed than those who did not eat chili pepper. Men on the chili diet also experienced a reduced resting heart rate and increased volume of blood reaching the heart. Research at the University of California at Los Angeles in 2006 found that capsaicin has a profound inhibiting effect on the growth of prostate cancer cells through a variety of mechanisms. Capsaicin triggers cell death in both types of primary prostate cancer cell lines. This research indicates a potential therapeutic regimen for the management of prostate cancer. Further research is also being conducted to examine capsaicin and its association with a reduced risk of breast, colon, gastric, and rectal cancer. Chili peppers, even when used in small quantities by those who are repulsed by the heat, can lead to long-term health benefits. When added to soups, chicken, beef, stir-fry, and other preparations, these spicy peppers can add a pungent flavor and a boost in your overall health. Try integrating them once a week in small quantities to slowly build a tolerance. With time, you will become more accustomed to the heat when consuming this spicy pepper. Extensive research has been done and continues to be executed to pinpoint the exact mechanisms in which chili peppers and capsaicin provide therapeutic benefits. Besides these significant health benefits, more research is being completed and suggests chili pepper’s role in weight loss, reduction of inflammation, sinus congestion relief, and antioxidant properties. By incorporating a little extra spice into your meals, there are substantial health benefits that can be gained. So in reality, it makes the heat, sweat, and maybe even the tears worthwhile. Haanpaa M, Treede RD. Capsaicin for neuropathic pain: linking traditional medicine and molecular biology. Eur Neurol. 2012;68(5):264-75. Ahuja KDK, Ball MJ. Effects of daily ingestion of chili on serum lipoprotein oxidation in adult men and women. British Journal of Nutrition. 2006;96:239-242. Mori A, Lehmann S, O’Kelly J, Kumagai T, Desmond JC, Pervan M, McBride WH, Kizaki M, Koeffler HP. Capsaicin, a Component of Red Peppers, Inhibits the Growth of Androgen-Independent, p53 Mutant Prostate Cancer Cells. Cancer Res. 2006;66(6):3222-3229. Cronin, J. R. (2002). The Chili Pepper's Pungent Principle: Capsaicin Delivers Diverse Health Benefits. Alternative & Complementary Therapies, 8(2), 110-113. Singletary, K. (2011). Red pepper: Overview of potential health benefits. Nutrition Today, 46(1), 33-47. Chaiyata, P., & Puttadechakum, S. (2003). Effect of Chili Pepper (Capsicum frutescens) Ingestion on Plasma Glucose Response and Metabolic Rate in Thai. J Med Assoc Thai, 86, 854-860. Lopez-Carrillo, L., Fernandez-Ortega, M. C., Costa-Dias, R., Franco-Marina, J., & Alejandre-Badillo, T. (1994). [Beliefs about chili pepper consumption and health in Mexico City]. Salud publica de Mexico, 37(4), 339-343.